I got called back to a customer's house who I worked for years ago. 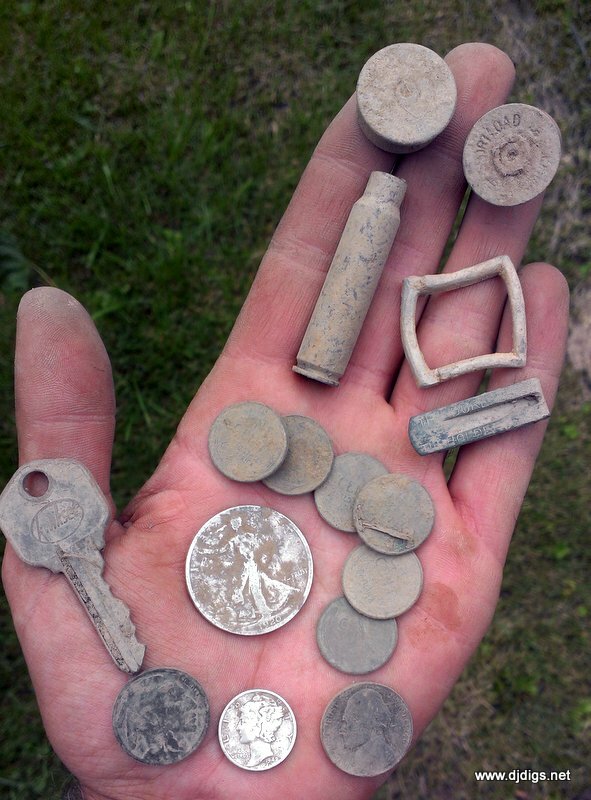 The first time out, I met the couple and obtained permission to detect their property. Part of the home just happens to be an old one room schoolhouse built in 1918. 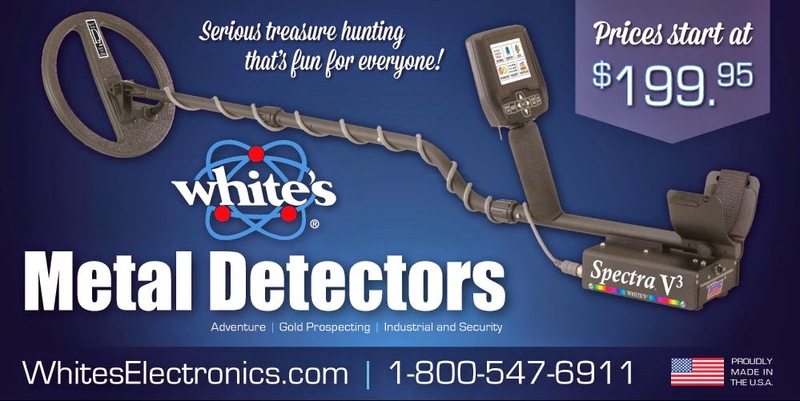 I detected at their house so long ago that I was using my Prizm V. I didn't come up with much other than a few wheat pennies. This time was different because I have more experience, I use my MXT now, and, most importantly, I did my research. I asked the homeowner questions about ground manipulation, work they had done, if he knew where the outbuildings were, etc. I also asked if he had any old photos of the property. I hit the jackpot! The homeowner handed me an album. There were thirty pictures of the reconstruction from the schoolhouse into the home. One picture showed exactly what I was looking for: piles of fill dirt and where they spread it on the original grounds. The first time I dug this site, I thought it was a bust. Turns out, I was digging in fill! 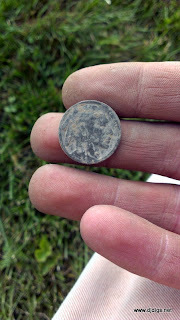 This time, I had a nice 20 x 40' area of original ground to detect. This was the old school playground. 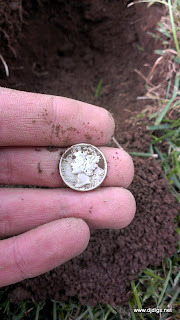 Coins started popping out left and right as soon as I hit the section of original ground. The first good sign was a wheat penny from the 1930's. Just a few steps away, I found a bunch of wheats. As I worked closer to the road, I got a great signal. 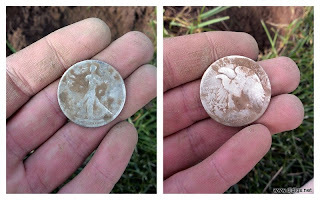 a nicely worn 1920 liberty half dollar. I couldn't believe it! 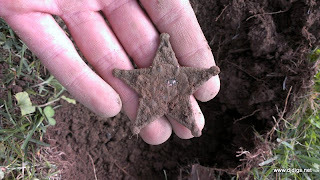 This is the 4th one I've found this year. Unfortunately, by the time I was done hunting, it had deteriorated into tiny pieces in my pouch. He was quite excited to see the old coins. We talked history for a few minutes and I got permission to return. It just goes to show, I thought the site was no good, but asking just one question turned out to lead me to the right spot! WOW! That's insane!! Woo hoo!! I did the same thing. 20 yrs ago I searched an area. Quit in 1993 after a heart attach. Started back this year. Asked myself Why didn't you search this field. 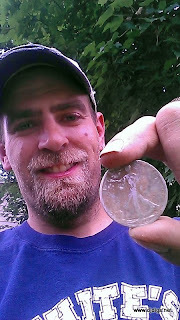 I did and found a 1917 walker and a 1950 franklin a week apart. Plus 2 silver rings and many silver dimes and quarters. By the way Great find on the 1920 half. I love the big ones.... By the way , I have the MXT also. Thanks Melvin! Glad to hear all is well and your back out detecting. That field you got sounds like a awesome site! Good luck on future outings and you got yourself a great machine there. This ethanol fireplace wall insert way, when you move be sure to check out. be made of crude materials but with the curve of the arch a few inches? Cast iron fireplaces are practical and one of my favorites and it is sensibly priced.